The Deep Six by Orta is an innovative product out of Silcon Valley, except there’s nothing high tech, or even low tech, about it. This decidedly no tech solution is for growing vegetable and herb seedlings right in your own kitchen. These self-watering seed starter pots are designed in Palo Alto and manufactured up the road in Oakland. Anne Fletcher, the maker of Orta (Italian for “kitchen garden”), was a frustrated home farmer. She would plant tiny seeds and diligently water everyday, until she didn't, and the vulnerable seedlings would wither and die. Working on a solution in her garage, the self taught potter, designed and produced a terra cotta, egg carton shaped vessel with porous walls and a built in water reserve that keeps seedlings hydrated for a few days. So, if you miss watering, they're not in immediate danger. When Anne debuted The Deep Six at The Heirloom Vegetable Expo in Sonoma County, she promptly sold out. Not only did the seeds grow, but so did her business. Whether you plant tomatoes, lettuce, or peppers this spring, start a seed to table revolution right in your own kitchen. Hello! I'm Anne, founder of Orta. I love cooking and growing unusual vegetables and herbs from seeds. However, after several years of killing my seedlings because I skipped a day of watering, I realized that, as a designer and engineer, I was more likely to invent a solution to the problem than to become the kind of person who never forgets to water. 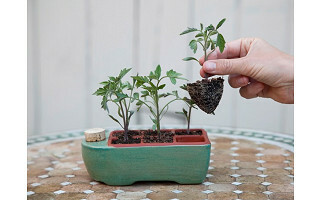 Hundreds (literally) of prototypes later, the Orta self-watering seed pots are finally available! I'm excited to share my creation with you on The Grommet and am happy to answer any questions you have. Have you ever tried rooting cuttings (rather than propagating from seed) in one of these, and if so how successful was it? @T Hello! The website backend was having some technical issues - sorry for the delay getting back to you! Yes, I have used the pots for rooting cuttings, and they work very well. I've had great success with perennial herbs like lavender, rosemary, marjoram, etc, as well as several perennial landscaping plants like erigeron and tangerine marigolds. I'm also experimenting with rooting roses. I have a batch rooting right now, and it looks like 4 out of 6 are thriving! This is Amy from The Grommet team. I'm here monitoring the questions today and see that Anne was able to answer your question earlier. We're here if you have any further questions or comments. I just love my orta pots. Not only are they so simpl and functional, they're attractive and make me so happy. Thanks for your support Erin. We like them too. The Deep Six by Orta is an innovative product out of Silcon Valley, except there’s nothing high tech, or even low tech, about it. This decidedly no tech solution is for growing vegetable and herb seedlings right in your own kitchen. 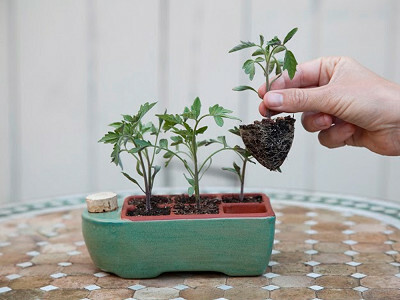 These self-watering seed starter pots are designed in Palo Alto and manufactured up the road in Oakland. Anne Fletcher, the maker of Orta (Italian for “kitchen garden”), was a frustrated home farmer. She would plant tiny seeds and diligently water everyday, until she didn't, and the vulnerable seedlings would wither and die. Working on a solution in her garage, the self taught potter, designed and produced a terra cotta, egg carton shaped vessel with porous walls and a built in water reserve that keeps seedlings hydrated for a few days. So, if you miss watering, they're not in immediate danger. When Anne debuted The Deep Six at The Heirloom Vegetable Expo in Sonoma County, she promptly sold out. Not only did the seeds grow, but so did her business.